Phast Parts Enterprise Co-Founder Martha Everhart had a customer call her and say ‘“Cuida de mis negocios por favor.” That means “take care of my business please” in Spanish. He needed her assistance in getting the immediate repair of some aircraft avionics components on his Learjet that was soon to enter the market for sale. Several of Martha’s customers are from Latin America and they seek her out to facilitate their aviation service needs in an English-speaking industry. It’s easy to understand why. As an American citizen originally hailing from Mexico with more than 20 years of experience working for aircraft manufacturers, Martha understands aviation and is able to overcome language and cultural barriers. She feels this sector is sorely underserved and does anything and everything she can to meet their needs. She therefore called the only other company she knew that cared about customer service as much as she does. She called Duncan Aviation. 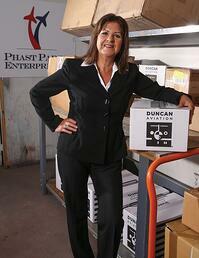 Tyler Lauer, customer account rep for Duncan Aviation’s avionics component repair services, answered her call. Tyler listened to Martha’s needs and took immediate action by calling in Matthews Pastor, another customer account rep, to assist. They tag-teamed the project by having Tyler work directly with the OEMs on units sent out for repair while Matthews managed and coordinated all work performed internally at Duncan Aviation. Martha has been in this industry a long time and says the level of customer service that Tyler and Matthews provided her is unique. “My customer called me and said, ‘I don’t know where you sent my parts for overhaul, but I am getting them back already and it’s only been three days!” All remaining units, except for one due to a backordered part, were returned to the customer in Mexico within one week.